«Богемна рапсодія» Брайана Сінгера зібрала у світовому кінопрокаті понад 600 млн. доларів і стала найкасовішим музичним фільмом-біографією в історії. 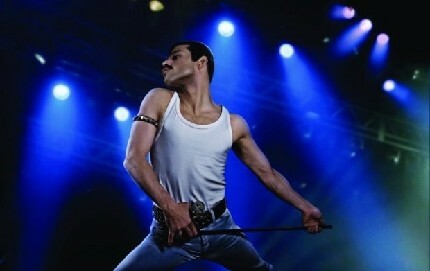 Continuing its pleasure cruise, 20th Century Fox/New Regency/GK Films’ Bohemian Rhapsody has shot past $600 million at the global box office, becoming the highest-grossing music biopic of all time domestically, internationally and worldwide. The split through Wednesday is $175.7M in North America and $433M at the international box office for a global cume of $608.7M. Nominated for two Golden Globes and two SAG Awards this week, the story of Freddie Mercury and legendary band Queen has now topped previous music biopic domestic record holder Straight Outta Compton. It’s also outperformed Fox’s own The Greatest Showman, a breakout that had extra-long legs from last year’s holiday corridor. This session, it will overtake 2008 musical Mamma Mia! worldwide (unadjusted). The offshore play through Wednesday continues to be led by the UK with $57.9M, followed by those phenomenal runs in Korea ($56M) and Japan ($41.7M). France ($29M) and Australia ($25.6M) round out the Top 5. Just two weeks ago, the Rami Malek-starrer had rhapsodized past $500M global. But it’s not all just a kind of magic. At the time, I detailed how Fox’s crack team, led by President of Worldwide Marketing Pam Levine and Co-President Kevin Campbell, as well as International President Kieran Breen, marketed another end-of-year hit musical, energizing fans old and new. Singalong versions have helped fuel some of the offshore fervor, particularly in Asia and Latin America. There has also been great success with premium formats like IMAX, Dolby and Screen X.
Bo Rhap is heading into its 7th frame (8th overseas if we count that it opened a week early in the UK). Last weekend, it crossed the $400M international mark to overtake Deadpool 2 as Fox’s biggest offshore grosser of 2018. The weekend dip was just 22%. In the midweeks in Korea this week, it’s still the top non-local title. As previously reported, the numbers are all the more remarkable given that reviews were mixed and that Fox fired director Bryan Singer last December (Dexter Fletcher, who has an EP credit, stepped in to finish shooting after Singer left). There is also no China padding here as the movie did not release there. Audiences have made the rockin’ world go round on this crowd-pleaser which broke free of any critical naysayers and now has Globe nominations for Best Motion Picture Drama and Best Actor in a Motion Picture Drama for Malek. The cast was also nominated by SAG this week with Malek landing in the lead actor race.